Did you know that the deadliest animal in the world is the mosquito? According to an infographic released by Bill Gates on his blog, mosquito kills approximately 725,000 people every year! These annoying pests carry devastating diseases such as malaria, zika, and dengue among others that can be fatal to humans. But did you also know that mosquitos bite other people more than others? 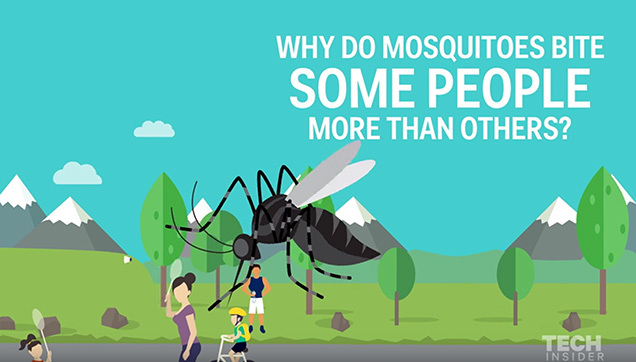 The informative video tells us that some of the reasons why a person may attract mosquitoes more than others - and it's not because "your blood is sweet." Scientists have discovered that it's because of the smell of your skin. Our skin is covered in different bacteria that produce different combinations of chemicals. Unfortunately for some, the combinations of chemicals on their skin make them more irresistible to mosquitoes! Another reason is high body temperature and it's why those who are exercising are more prone to attract mosquitoes. Other reasons they are drawn in are because of the lactic acid and carbon dioxide our bodies produce. Research also shows that beer drinkers are more prone to mosquito bites.